SALEM—Coming off the bench, McNary senior Hannah Carr’s approach at the plate was simple—just make contact instead of trying to win the game with one big swing. Down by six runs with two outs in the top of the sixth inning, that’s exactly what the Lady Celts needed. 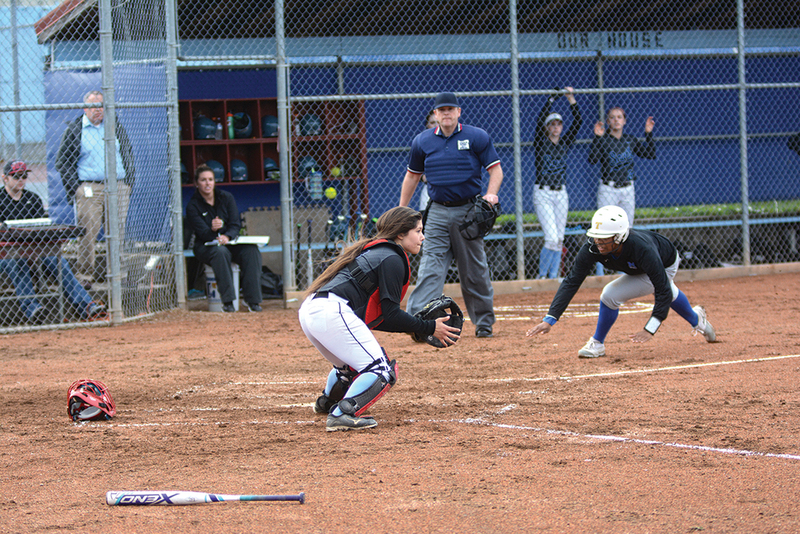 With two strikes, Carr singled through the middle of the infield to begin a rally that ended with a McNary come-from-behind 9-8 victory on Thursday, April 6 at South Salem. The Lady Celts fell behind 3-1 and did little on offense until the fourth inning when South Salem pitcher Maygen McGrath walked the bases loaded but got Nadia Witt to ground out to end the threat. The Saxons appeared they would make McNary pay, putting two runners on base with no outs in the bottom of the fourth but pitcher Faith Danner, who threw all seven innings to earn the win, caught a line drive and turned a triple play to end the inning. However, South Salem did cash in an inning later. With one out in the fifth, Erin Elmore hit a grand slam to give the Saxons a 7-1 lead. McGrath then retired the first two batters in the sixth before Carr led the McNary come back. After Sabella Alfaro singled and Witt walked to load the bases, Alexa Cepeda singled on a line drive to left field to score Carr from third. Haley Ebner then drove in Alfaro and Witt with a base hit to center field. Cepeda and Ebner scored on an error to get the Lady Celts within 7-6. McNary had just three hits against McGrath entering the sixth. “I think we figured out where she was throwing us and what she was throwing,” Wise said. Trying to extend its lead, South Salem got runners to second and third in the bottom of the sixth but pitcher Faith Danner got a ground ball to second base, which Carr threw to Ebner at first to end the inning. Emma Kinler, who was 0-for-3 with three strikeouts against McGrath, singled to lead off the seventh. Nicole Duran followed with a single and Kinler scored on an error in center field to tie the game at 7-7. Haley Bingenheimer then doubled to drive in Duran and give McNary an 8-7 lead. Bingenheimer added an insurance run, scoring on another single by Carr. South Salem threatened in the bottom of the seventh as two runners reached base on back-to-back infield errors. After Danner got the first out of the inning on a fly ball to right field, the Saxons got within 9-8 when Duran fielded a ground ball at third base and threw home but the South Salem runner was able to beat the tag. With the tying run on third base and just one out, Carr caught a line drive at second and threw to third to turn a double play and end the game.